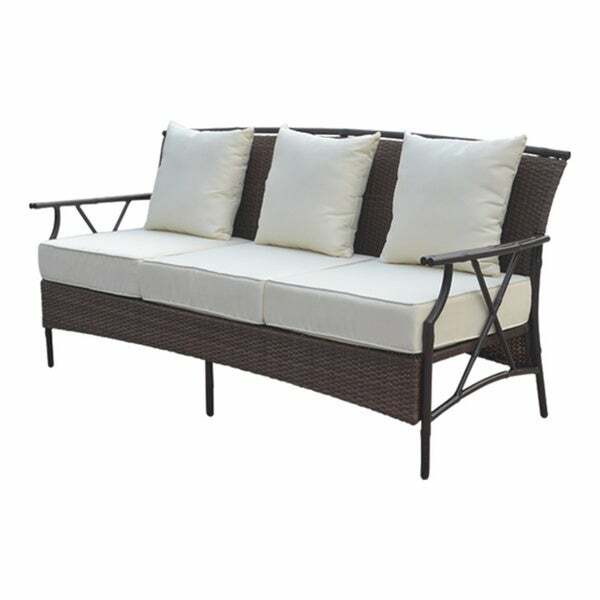 Bring the relaxation of the Bahamas to your back yard with this Panama Jack Rum Cay sofa with cushion. The antique brown finish of the Viro branded fiber gives the sofa elegance and durability. The bamboo shaped metal frame is both tropical and urban. Rust resistant and able to withstand extreme weather, this patio sofa will add a contemporary sophistication with a tropical twist to your back yard. Panama Jack Rum Cay sofa with cushion. The antique brown finish of the Viro branded fiber gives the sofa elegance and durability. The bamboo shaped metal frame is both tropical and urban. Rust resistant and able to withstand extreme weather, this patio sofa will add a contemporary sophistication with a tropical twist to your back yard.